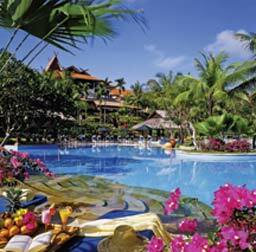 Rooms and villas with breathtaking views of the South China Sea and tropical gardens will make your stay memorable. Resort sea sports include kayaking, jet skiing, windsurfing, and scuba diving. Golf options include championship courses designed by Jack Nicklaus and Ian Baker-Finch. Its 12 food and beverage outlets feature Indonesian, Mediterranean, Japanese, and Chinese cuisines.